Face it parents ... at some point, your children will require a celebration of their advancing ages. There are dozens of places you can reserve, but perhaps you feel as if you’ve seen all that Long Island venues offer? If so, here are eight new spots you might not have tried yet. These venues range from simple and classic to trendy and challenging. The good news is that with these fresh options adult guests can graduate from simply standing by and supervising to getting in on the fun. (Of course, you're still supervising—you are still the parent, after all). Find even more birthday party inspiration in our Long Island Party Guide for Kids. Or have an entertainer come to you for a memorable party experience. Winter babies and summer kids alike can enjoy playing glow-in-the-dark mini-golf on the lower level of one of Long Island’s premiere shopping destinations. It’s open to hosting birthday parties, but call ahead if you’re looking to arrange a soiree. Kids can play as part of a party for as little as $12 each, but again, call ahead and speak with a representative. Escape to Just Escape for a unique birthday party. At this interactive, solve-your-way-out adventure venue children ages 14 and younger must have adult accompaniment. 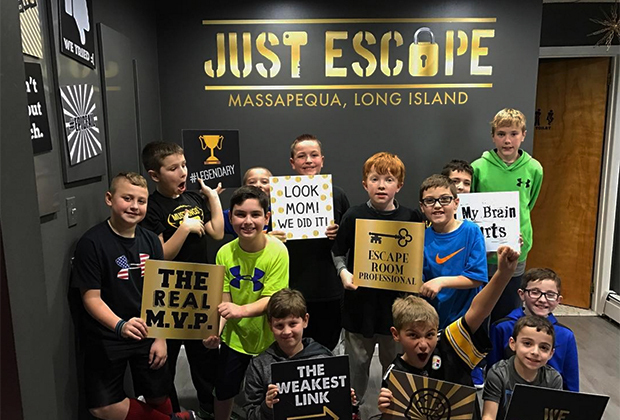 Rooms include “Sweet Revenge,” “Underworld” and “Carnival Conundrum,” and birthday parties can be tailored to suit group size, duration of challenge, difficulty, and level of scariness. Opened in September 2017, Momo’s features a three-tier jungle gym that includes three slippery slides, play stations, including a pretend kitchen and farmer’s market, and more. Crawlers have their own space, and parents can supervise from the nearby cafe. Party packages begin at $599 for 12 children and include exclusive use of the play space. The most expensive package, $899 for 12 kids, includes a number of memorable add-ons. If this spot seems familiar, it’s been around for years, but is now rebranded as RPM from its former name of “Pole Position Raceway.” As before, guests can race each other in electric go-karts. Remember, all kids who drive must be at least 8 years old and 48 inches tall (parents must sign waivers for children to drive). Also don’t bother dolling the kids up for a party here as all will be wearing helmets at some point. The less costly birthday-party option is $40 per guest, and includes one race, a $5 arcade card, one hour of party room usage, a soft drink and two slices of pizza. For $50 per guest, each guest gets two races instead of just a single run. Check the RPM website for party add-ons. This bright, open, and modern play space opened late in 2017. Kids can socialize in its fenced-in play that is filled with toys, books, and more. Crawlers and tumblers will appreciate the cushioned floor, and parents can enjoy a relaxing coffee and treat from a few feet away. Parties here begin at $495 for 90 minutes and include 15 invites, pizza, drinks, and more. You can customize your party up to a maximum of $895 for 20 invites, and add-ons are available. This well-known national restaurant franchise came to Long Island in 2017. Its menu is burger lover-friendly and classic American. Still, if you prefer an old-fashioned, eat-and-do-cake affair, you can do fine here. It has three birthday packages, starting with a one-hour gathering with a kids meal, ice cream cake, and candy for $11.99 per child. For $18.99 per child, you can arrange a 60-90-minute party that includes a kids meal each plus cotton candy and a make-your-own, one-scoop sundae. The top deal features a set price of $350 and includes a balloon animal maker, face painter, and a party gift (price is for two hours for 10 kids, each additional kid is $29.99). Kids' birthday parties are a 10-person minimum. Escape rooms are in right now. So if you’re seeking to impress older kids who aren’t too old for a birthday gathering, an interactive, time-limited mystery adventure should be good. It's recommended for ages 8 and older; children younger than16 must be chaperoned and kids younger than 5 are not allowed. You can book escape games such as "Casino Heist," "Pirate's Adventure" and "Harry Potter Escape," with each offering a number of challenge levels. Private rooms can be booked, but remember, if you reserve spaces in rooms whose capacity exceeds your group you might have strangers mixed into your adventure. 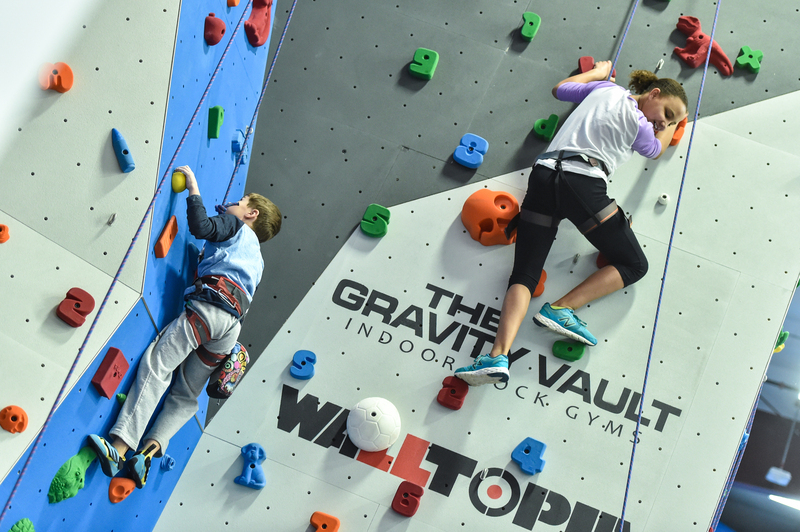 Scale to new heights at The Gravity Vault. Ideally suited for children ages 5-13, this spot is dedicated to rock climbing. Of course, the rocks here are indoor and man-made, but the play still has some challenge to it. Birthday parties come in two packages. The first includes 90 minutes of climbing and a half-hour in the party room, plus invitations and a T-shirt for the birthday child for $ 299 (up to 10 guests, each additional guest is $29). A second 90-minute climbing package is $369 (up to 10 guests, each additional is $36), and includes two slices of pizza per guest plus drinks (soda, lemonade, water) and necessities such as tablecloths, napkins, plates, cups, utensils, and balloons. Top photo: Glowgolf offers traditional mini-golf with a twist — it's played under black lights. Photo by Jaime Sumersille.